We’ve seen multiple ice anchor desks sprout up over the country during the winter weather coverage over the past few weeks. 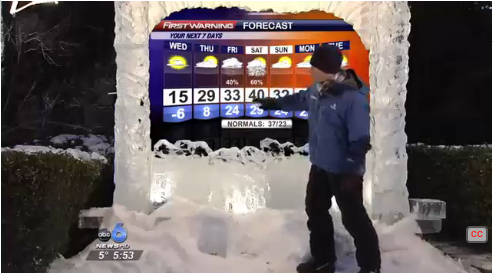 Not to be outdone, WSYX-TV, the ABC affiliate in Columbus, Ohio, built what it’s calling the “First Warning Ice Center” — an outdoor chroma key wall wrapped in real and faux ice. 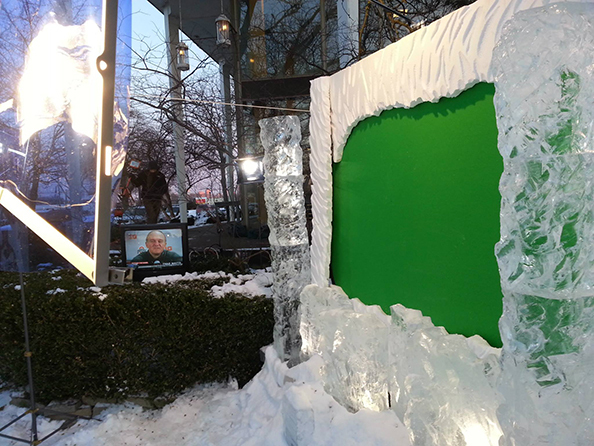 The green screen was framed by a carved ice knee wall and two columns and a fake ice header. The station also added some uplights behind the ice, which created an interesting effect. During forecasts, the station framed the shot wide, allowing viewers to see most of the structure as well as the snow drift beneath — this did cause the weather graphics in the green screen area to become smaller.